Kate Forsyth’s novel Bitter Greens interleaves the scandalous life of Charlotte-Rose de Caumont de la Force (1650-1724) with Persinette (“Little Parsley”), her retelling of Petrosinella – the first published Rapunzel tale – by Giambattista Basile (1634). Mademoiselle de la Force changed the ending to have the prince’s eyes healed by Persinette’s tears and to redeem the witch. Affair of the Poisons (1677-1682), the King’s mistress, Marquise de Montespan, allegedly purchased aphrodisiacs and performed black masses with midwife, “La Voisin”. Charlotte-Rose, lady-in-waiting to de Montespan, was imprisoned in the Bastille for black magic, but acquitted. Forsyth delights in her heroine’s passionate nature. The mature Charlotte-Rose, 36, fell in love with under-age Charles de Briou, 24. During Carnivale, Charlotte-Rose disguised herself as a dancing bear to talk with Charles imprisoned in the family fortress. They married after he came of age, butthe family had the marriage annulled citing “abuse of position”. In Bitter Greens key events in the colourful life of Charlotte-Rose are paralleled with the shocks endured by Margherita in Italy. Margherita, a much-loved only daughter, was promised to the witch, La Strega, for a parsley-based love spell bought by her mother and for parsley stolen by her father to ease the childbirth. La Strega kidnapped Margherita on her seventh birthday. Renamed Petrosinella, she learned singing at the Venetian orphanage, a joy that enabled her survival in, and eventual escape from, the tower where she was imprisoned from age 12. A sense of freshness and the element of surprise are difficult to deliver in fairytale retellings because the plots and motifs are so well known. Forsyth delivers by anchoring Margherita’s tale at a specific time (early 1600s) in Venice and Lake la Garda. The redemptive actions in de la Force’s “Persinette” – the heroine heals her lover’s blinded eyes with tears and forgives the witch – form a framework for Forsyth to conclude Bitter Greens. The fairytale collection enabled Charlotte-Rose (alias “Mademoiselle X”) to regain her freedom, physical and financial, from the convent to which she was exiled by King Louis IV for her unconventional life at court. Upon release, Bitter Greens was labelled Random House’s book of the month – a high recommendation that will be endorsed by fans and those new to Forsyth’s work. 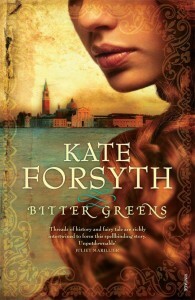 Kate Forsyth’s 25th book, this is adult historical fiction and a fairytale retold par excellence.